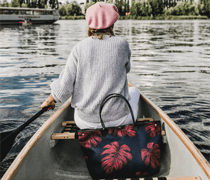 With their ultra contemporary styles and unique appeal, Umbra are a go-to brand for those looking to add a creative edge to their home. 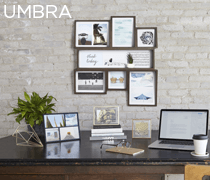 Across the Umbra wall decor selection you can discover everything from stylish picture frames and hanging baskets to modern, decorative wall art. If you’re looking for a stunning way to showcase your favourite pictures, the Umbra wall decor selection is sure to have a photo frame to suit your needs. Choose from singular or multiple frames in a variety of eye catching designs: keep it simple and chic with aged walnut, or choose a copper frame to add an instant touch of style. To transform your photos into a piece of art in their own right, why not opt for a clothesline photo hanger, or a hanging multi photo display? 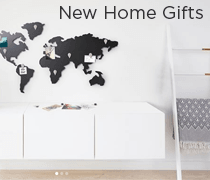 Aside from a gorgeous photo frame selection, throughout the Umbra wall decor range you can also discover home accessories including hanging wall art and innovative storage solutions. From wall hooks and shelves to plant vessels and statement mirrors, here you can discover modern accessories that will create an instant stylish talking point in any room.